Independent Project Analysis (IPA) is pleased to announce the release of its third book on improving capital project outcomes. 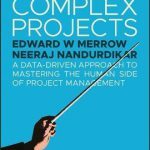 Leading Complex Projects: A Data-Driven Approach to Mastering the Human Side of Project Management, by Edward Merrow, IPA Founder and President, and Neeraj Nandurdikar, IPA Oil and Gas Practice Director, gives readers a first-of-its kind, in-depth look at the quantitative links between individual project manager characteristics and project results. Many books have been written on project management, but it is rare to find books that specifically focus on project managers. Filling this void, Leading Complex Projects begins as a data-driven exercise in examining the backgrounds, education, and personality characteristics of the individuals responsible for leading projects. Merrow and Nandurdikar explain why complex projects require leadership, not just management, and highlight the characteristics successful complex project leaders share with other highly successful leaders in other walks of life. The second half of Leading Complex Projects reinforces these data with detailed profiles of seven successful project leaders, who candidly share valuable insight into their career development and practices that led to their success. Leading Complex Projects lays the groundwork for improvement, not just for project managers, but also for project organizations as a whole. Those responsible for leading complex projects come away with a better understanding of personal strengths and areas of opportunity. For project organizations, the book serves as a blueprint for selecting the right person to lead a complex project and deliver the desired business results.